A Snug (or antihelix piercing) is a piercing made through the anti-helix of the ear. A Snug piercing is located on the bottom part of the ear rim, passing through the inner cartilage and is so called because of its closeness to the curved ear ridge. The snug is a fairly small, shallow area where the cartilage is not very thick, making for an easier piercing than the rook. The most popular jewellery for this type of piercing would be a curved barbell, ball closure ring (BCR) or even a horseshoe ring (CBB). The curved bar is usually either 6mm or 8mm in length and normally the piercing is 1.2mm (16 gauge). BCR and CBB jewellery would tend to be slightly larger at 8mm or 10mm. 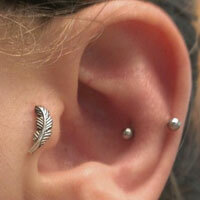 Initial healing time for this piercing would be 2 to 4 months with a full healing time typically of 6 to 12 months.